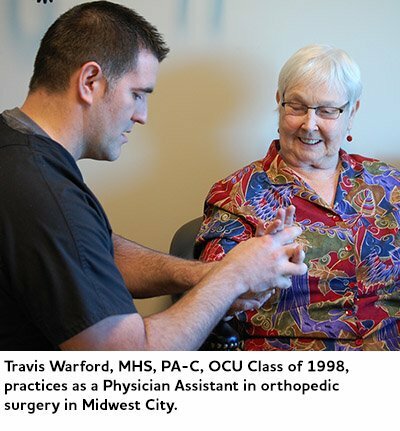 Oklahoma City University (OCU) has embarked on a major initiative to impact the delivery of health care in Oklahoma through the development of a new Physician Assistant (PA) Program. PAs have repeatedly demonstrated their value as competent, flexible and economically prudent medical practitioners in today’s society. With Oklahoma ranking near the bottom of states in access to primary care and in metrics of health status, a more robust PA workforce is a vital need for our citizens. The PA Program received accreditation-provisional in September 2015 and matriculated its first cohort of students January 4, 2016. OCU enlisted the assistance of many PAs, physicians and community leaders to develop a Program that will produce graduates with a mission to improve the lives of citizens in the communities they serve through a thorough understanding of disease mechanisms, application of critical thought, community service, servant leadership and life-long learning. The OCU curriculum provides twelve months of classroom training presented in a systems-based format. By using this approach, students are able to focus their intellectual energies on cardiology, then pulmonology and so on until all the body’s systems have been covered. In addition to the basic and medical sciences, the Program has a specific interest in developing student passion in the medical humanities. The classroom phase is followed immediately by sixteen months of supervised clinical practice experiences in various medical settings and specialties. At least one of the experiences will involve rotating in a charitable clinic providing medical care to our neighbors in need. A unique aspect of the OCU program involves providing a parallel online course of study in business aspects of medicine. This added component provides the OCU PA student a greater understanding of medical practice management which is critical to contributing to a successful practice. The final month of the PA Program is a time for students to demonstrate competence in the art and science of medicine and readiness to enter the PA profession. The Mission Statement and Goals for the program describe lofty ambitions. Please be assured the institution and PA Program faculty are committed to these ideals. Ongoing program self-assessment processes including analysis of test and skill performance data, student and faculty evaluations of courses and clinical experiences and analysis of graduate metrics will provide evidence that Program Goals and student learning outcomes have been satisfied. The Program will make these data and analyses available on its website for public review. For more information on the program, contact Amber Hicks at ahicks@okcu.edu or call (405) 208-6260. Graduate Admissions can also be reached at gadmissions@okcu.edu or call (405) 208-5094.